The weather here is so unautumnal (non-autumnal?) that I picked those roses yesterday morning. I've never picked roses in May before & there are plenty more buds ready to blossom. The jug is sitting on my current pile of books I'm either reading, planning to read or dipping into. Antonia Fraser's Boadicea's Chariot is on top of the pile because of Zenobia, Queen of Palmyra. I'm listening to Gibbon's Decline and Fall of the Roman Empire on audio (6 vols, about 130 hours in all. I'm about 13 hours into Vol 1) beautifully read by David Timson & yesterday while I was driving around shopping, I heard the story of Zenobia's revolt against Rome. I wanted to know more & thought that there was a chapter on her in Fraser's book so when I got home, I sat down & read it. (This is my justification for not Kondoising my books! Have a look at this heartfelt article on just that subject. I'm always dipping into my books when a thought or a reference leads me somewhere & as to throwing out books I haven't read yet or tearing out the pages you want to keep & throwing away the rest - words fail me!). 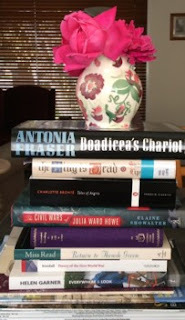 I've had Boadicea's Chariot since 1988 & I know I could have googled Zenobia but I loved reading Antonia Fraser's view & it was quicker to grab the book from the shelf than to wade through a lot of websites. I also now want to reread her chapters on Boudica. I'd also been humming The Lusty Month of May from Camelot during the week (& here's the incomparable Julie Andrews singing it. The photos in the clip are from the original production with Richard Burton & Robert Goulet. Just beautiful). So, when I was thinking about a poem for the week, I wanted something about May.This poem by Thomas Dekker may well have been an inspiration for Lerner & Loewe's song which is lovely even though it's about Spring rather than Autumn. So frolic, so gay, and so green, so green, so green! Sweet Peg, thou shalt be my Summer's Queen. Lo, yonder she sitteth, her breast against a brier. Should sing where my Peggy and I kiss and toy. Oh Lyn, it's that warm in Melbourne too! We've had two months of well above average temperatures too, it's very worrying. We did have a spectacular thunderstorm at about 4am this morning (Lucky went straight under the bed & Phoebe appeared from the lounge chair where she had been sleeping for some extra comfort next to me)& it's been cold & windy since then. Another cool change on Tuesday apparently & then maybe autumn will have begun. But I've been wrong before!